It's that time of the week again to share some of those great conversations from our forums that make them the best in the webOS Nation. If you want to join the community in talking about webOS smartphones, tablets, apps and events, you can click through the links below to see some of what is going on over there, and then register for a free account to let your voice be heard. 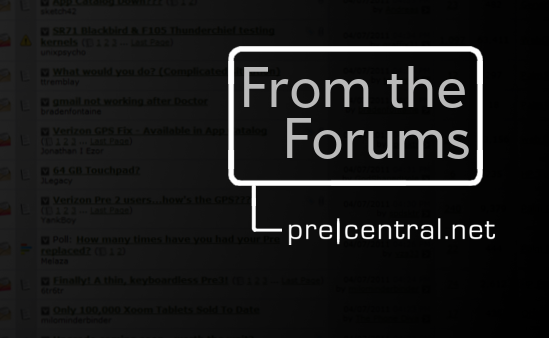 If you have stories you'd like to share in a future "From the Forums" update, send an email to tim@precentral.net and we'll try to add it in! Still looking for more Promo Codes to add apps to your webOS smartphone or TouchPad? In the webOS App Promo Codes section of our forums, developers far-and-wide converge to share limited promotional codes to get PreCentral members their apps. Right now, you can get Wild'n Video Poker HD in the UK, Children's Piano for the TouchPad, and plenty more (with others being added every day). Just goes to show you don't need to wait for our weekly Promo Code giveaway or even HP's 6-pack giveaway to get great apps; you can find them right in our forums, too! Getting those promo codes might be handy for filling a TouchPad that you're giving away, as user BobKy will find out soon. He recently was one of the lucky ones to get an extra HP TouchPad to give to his daughter and wants to get it setup for her with all of the best goods before putting that gift-bow on top. Besides adding family photos, favorite music, videos and apps or installing Preware; what are some other ways that you would prepare a TouchPad for giving to a family member or friend? In Europe, would you believe it, there are more than a few new webOS users carrying the HP Pre3 out into the wild. User WinstonSmith is one of those new users, and in his thread he shares some of the problems that he's found with webOS and the Pre3. Luckily for him, our members have a lot of experience with webOS devices and help him find solutions for a few of those problems and get him going with some of the hidden features that we've come to know and love. See what else was said about the webOS smartphone and read the responses that follow right here, but don't forget to add your voice if you have something else to say! With the HP Veer seeing some massive discounts online (just like the TouchPad), some users have been buying out the inventory to use as a secondary device. User LvPepper has taken that a step further and is thinking about giving a Wifi-only connected Veer to his mother to use as an advanced MP3 player. He's asked a few questions and our members have replied in kind, but maybe you've got some questions/answers of your own. Check it out here.